A suite of tools, comprised of four modelling approaches, has been and is being developed to decide which parcels of land should be purchased and set aside for the use of jaguars, both as habitats and as transport corridors to move between habitats. 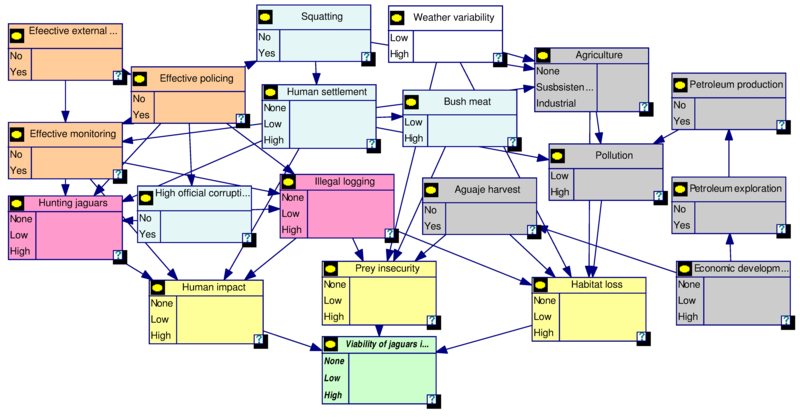 The very last step in the modelling is a multi-criterion decision making tool, essentially a checklist, which is used to categorise the suitability of parcels of land as potential jaguar conservation units, refuges, safe corridors or unsafe corridors. 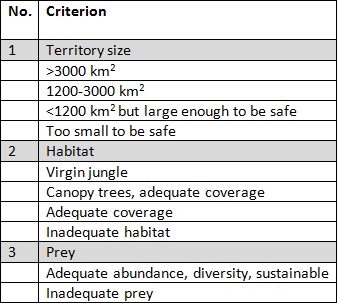 This categorisation relies on understanding how many breeding pairs a parcel of land is capable of supporting and whether or not it’s safe for jaguars to use the land either as a habitat or transport corridor. A spatial model describes where jaguars are most likely to be, based on factors such as access to water, the density of foliage in the forest, and elevation above sea level. By considering the relationship between sightings of jaguars and the local environment, it is possible to predict the probability of seeing a jaguar at other locations. Identifying areas where jaguars are likely to be found, is a valuable part of determining where to focus efforts on searching for jaguars. The spatial modelling will also investigate the routes that jaguars take as they move around, to ensure that decisions are being guided by whether or not the jaguars actually move within an area identified as a potential corridor. In order to understand the population of jaguars in the locations where they live, a simulation-based model of the population dynamics was developed. This model makes use of data about the populations of jaguars and other species such as fish, deer, primates and anteaters, and supporting plant life such as aguajale trees and others that bear fruit and seeds which are eaten by a variety of these species. The model describes the birth, death and family dynamics of jaguars and their cubs and the interaction with the other species, either as prey or as competitors for resources. By simulating a variety of scenarios, such as different birth, death and breeding rates, e.g. 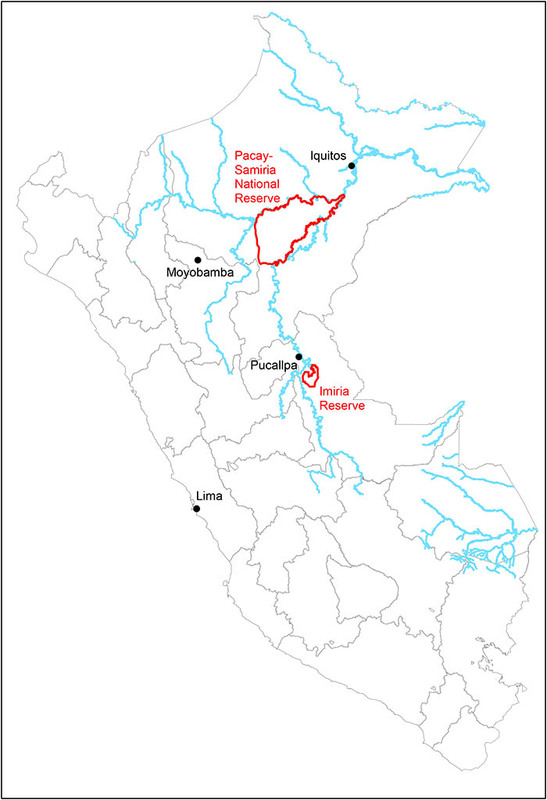 negative pressures such as poaching and positive pressures such as indigenous land co-management, an understanding of the likelihood of a sustainable jaguar population in a particular region of Peru can be obtained. A Bayesian network model was developed to account for the complex interrelationships between multiple variables in the data set by looking at the links between them in terms of simpler probabilistic relationships. For example, rather than attempting to model the direct influence of the harvesting of aguajale trees on the suitability of a parcel of land, the aguajale harvest is assumed to directly influence only “prey insecurity”, a measure of the availability of prey, and “habitat loss”. The aguajale harvest variable itself is assumed to only be influenced by “economic development”. In this way, the network model is able to model quite complex behaviour with a collection of variables which are assumed to influence and be influenced by a small number of variables. Once the network model has been built, it’s possible to simulate different scenarios (e.g. different levels of economic activity) to see how sensitive the suitability of land is to changes in the variables, and therefore determine which variables have the most influence. Once it’s known which areas jaguars are likely to live in and which are the most important factors influencing their survival in those areas, the checklist will be used to categorise the land based on how suitable it is as a Jaguar Conservation Unit (JCU) and to determine how vital it is as part of the network of conservation units. For land which is almost appropriate for use and may be a vital connection between two JCUs, refuges or safe transport corridors, simulation with the Bayesian network model will help identify whether any policy changes (e.g. bringing in local indigenous communities to co-manage the land) can make the parcel of land fit for purpose.